There is a gnarly and dreaded creature that stalks the Monarch caterpillar...if you weren't paying any attention, you wouldn't even be aware of this monster. 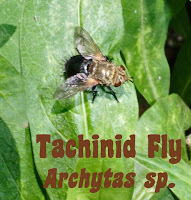 It is the Tachinid Fly! 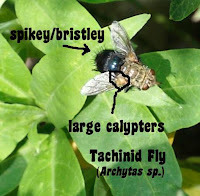 The Tachinid Fly is a very small but deadly predator to the Monarch. This disgusting fly lays its eggs in the caterpillar OR on the egg. these stringy things start to come out of the chrysalis. Next, these little brown things come out (the fly's pupae which is called a puparium). Here is an empty puparium (exuvia). And, here is a baby Tachinid Fly (just hatched!) on an Asclepias curassavica 'Silky Gold' milkweed blossom. How do you know your caterpillar has been attacked? 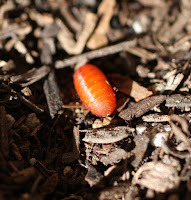 It is hard to know ahead of time IF you have collected larvae from outdoors. 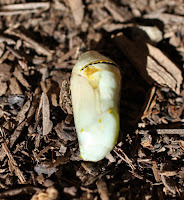 The best thing to do is to gather eggs as soon as you see the mama oviposit (lay eggs) onto the Milkweed. You can, however, determine if your pupae is parasitized (meaning, your caterpillar was parasitized and is now an 'infected pupae'). 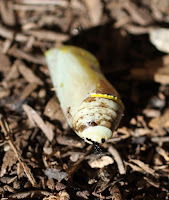 If you leave the pupa as is, then eventually, you will get those long, stringy things as in the picture at the top and find the puparia somewhere on the ground (or on the bottom of your habitat/rearing container). 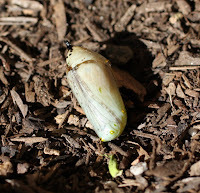 The best thing to do is to destroy the pupa BEFORE the Tachinid Fly pupae have an opportunity to come out and hatch. 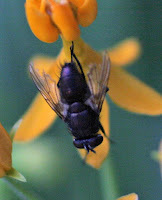 These flies do not fly erratically or speedily like houseflies or horseflies. Instead, they move slowly and will wait for the right moment to lay their eggs onto an unsuspecting caterpillar (or egg). The Tachinid will lie in wait and sneak up on the Monarch caterpillar while it is eating and oviposit its eggs usually, behind the caterpillar's head before flying off. Because they are not fast-moving flies, eradicating them in your butterfly garden isn't difficult. Just be on the lookout for a hairy fly and get ready to smash 'em, zap 'em, or…well, you choose your method! Special Note: There IS another 'stringy thing' that you may spot in the garden…that you may wonder, "What in the hEcK is that!?" If you find a long, thin silky thread with a little egg dangling at the end, this is nothing to worry about. 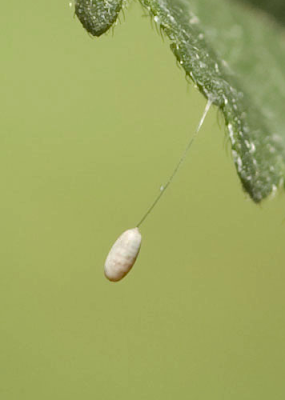 This is a Lacewing (Chrysopidae) egg. The larva feed on soft-bodied insects like aphids, spider mites and leafhoppers and the adults feed on pollen, plant nectar, and aphid honeydew.